Is your kitchen in need of a makeover? 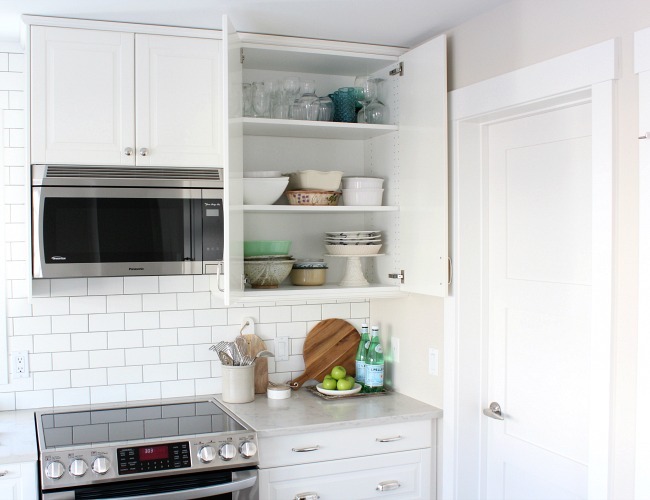 Come take a look at the classic white kitchen renovation finishes we selected to give our basic IKEA cabinets a custom look! Hello, friends! 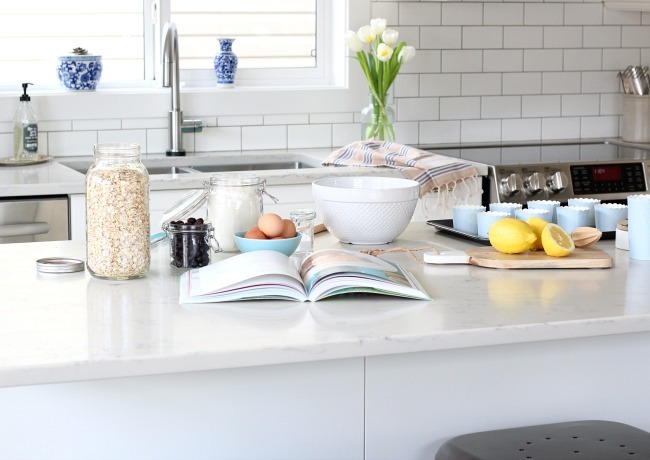 After receiving a whack of questions about our classic white kitchen renovation (aka IKEA kitchen makeover), I thought I’d share the details with you. Today, I’m kicking things off with with a run-down of the finishes we ended up going with compared to what we had originally planned. First off, let’s back way up and see what the original kitchen looked like (with a few appliance upgrades). Needed some help, right? 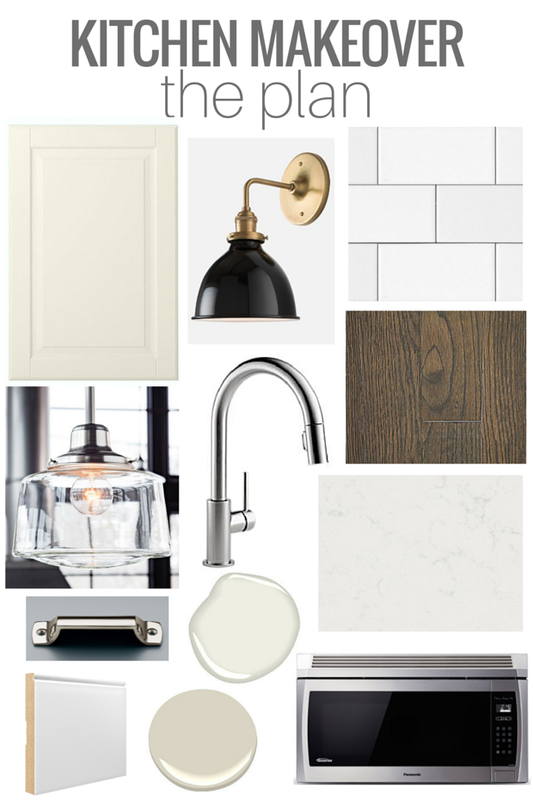 As usual, I began this makeover project with a cohesive design plan that included the layout of the new cabinets and appliances, as well as selections for all of the pretty stuff, including light fixtures, flooring, cabinet hardware, paint and more. Doing my homework and planning ahead means I’m less likely to go over budget or feel under pressure to make haphazard decisions once we’re in the thick of it. Now that the dust has settled and we’ve been able to enjoy our new kitchen for well over a year, we’re thrilled with the final result. I have the classic white kitchen I always imagined for this home and we were able to complete it all on a modest budget. As you can see, almost all of what I selected in the original design plan made its way into our final kitchen. 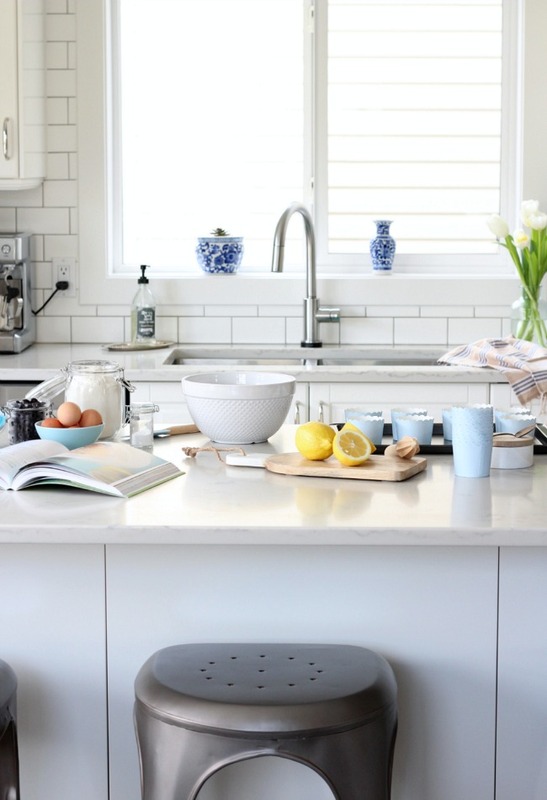 A small white kitchen that’s hardworking, yet pretty. So, which kitchen finishes changed and why? 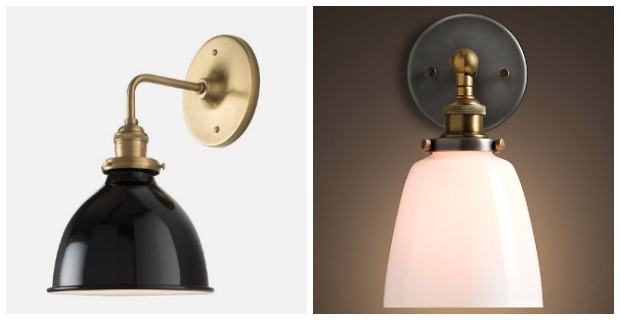 After pricing out the original black sconce for above the sink window, the exchange rate and shipping from the US were crazy, so I dropped it. Instead, I waited for a sale and ordered this milk glass cloche sconce. 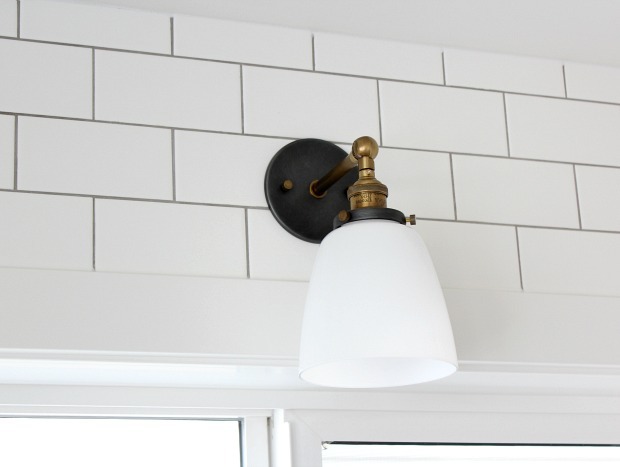 I love the mix of the aged steel and brass that seem to pop in front of our white subway tile backsplash. It also gives us that extra bit of task lighting in the dark months of winter. 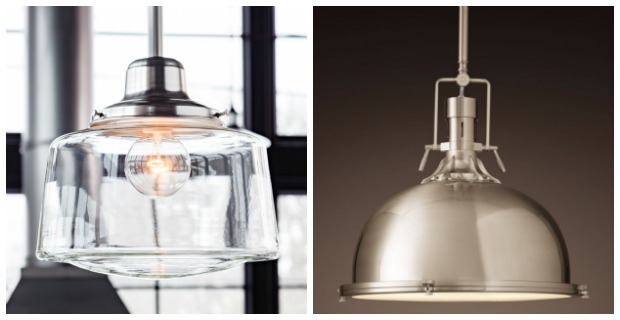 For the kitchen island, I selected these classic brushed nickel pendants instead of the original schoolhouse glass fixtures. After taking a look at similar clear glass pendants in person, I wasn’t keen on the type of light the exposed bulbs provided. The softer, yet bright glow from the ones we went with is perfect. In addition, I love the industrial vibe they add. 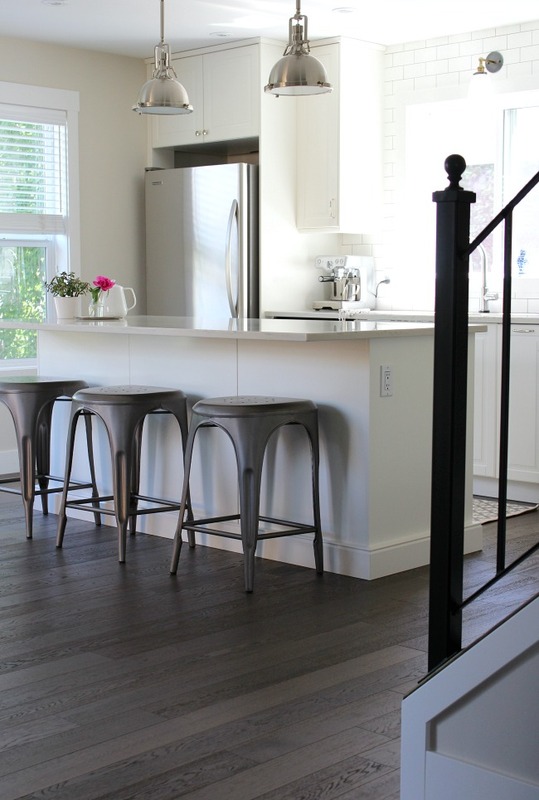 On a side note, love those IKEA Bodbyn off white kitchen cabinets with dark floors! My original idea was to go lighter, but this selection seemed to work better. 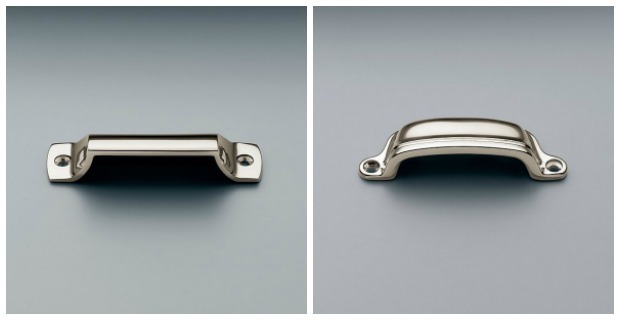 The changes in kitchen drawer hardware were very subtle from a squared-off cup pull to a curved one. Basically, this one came down to both feel and looks. For the larger IKEA Bodbyn drawers, I placed the pulls side by side to create more of a furniture feel. For the smaller drawers, I opted for a single cup pull, as well as a classic pull for the top narrow drawers. Although I was afraid the polished nickel finish would be high maintenance in a busy kitchen, I decided to go for it anyway. I love the bit of sparkle it adds, and it’s less of a bother to shine up than I originally anticipated. I also like how they brighten the look of the IKEA off-white cabinets. For the tall IKEA Bodbyn cabinet doors (upper and lower), we installed the same classic pulls as the top drawers, but in a vertical position. For the shorter upper cabinet doors, we went with a classic knob. I like mixing kitchen hardware as I think it looks more interesting. What do you think? For the kitchen countertops, we ended up going with TCE Stone 4005 instead of the original Frosty Carrina. Not only did it save us a bunch, but we also liked the colour and veining better with the IKEA off-white Bodbyn cabinets. I like how it ties everything together. 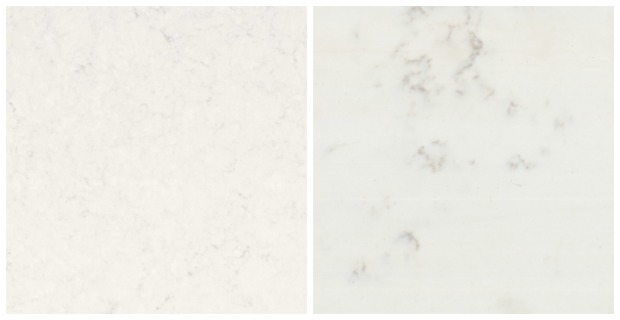 Quartz is a better choice if you’re worried about stains you’ll most likely get with marble countertops. I don’t want to live with anything that’s high maintenance. 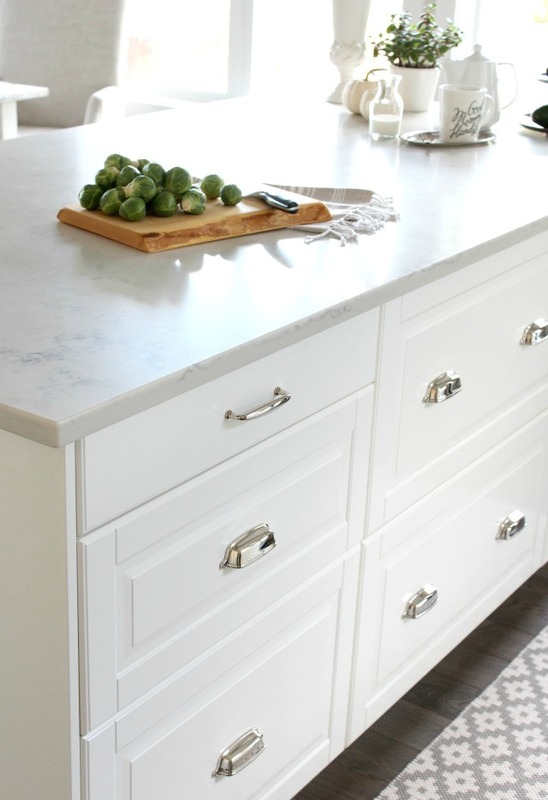 For detailed info, read about our kitchen countertop selection process and why I think it’s important to take a look at the actual slab you’ll be installing. For the remaining kitchen finishes, everything stayed the same as in the original plan except for the trim. After some thought, I decided to switch from a bevelled version to simple flatstock MDF. I decided to keep the style consistent with our basement for a cohesive look, which creates better flow in a home. Miss a kitchen post? Go HERE to see more! 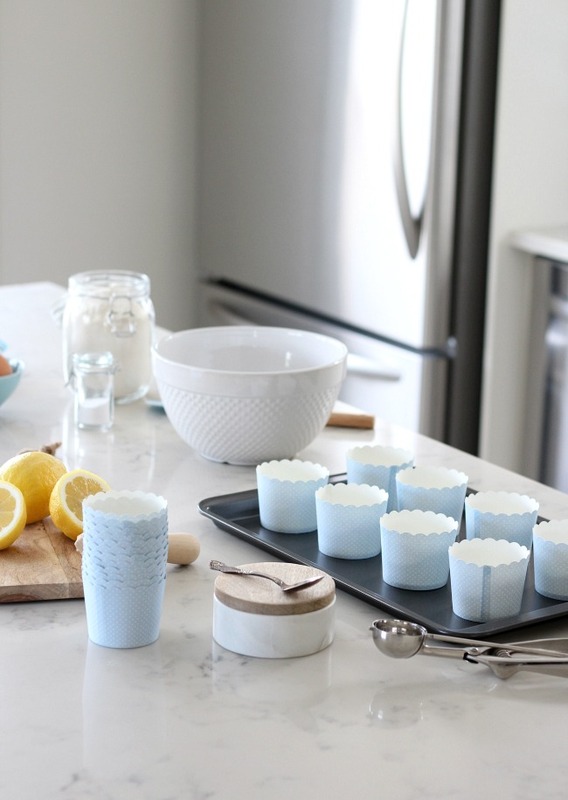 As well, do you want to know where I picked up some of the kitchen decor spotted in these photos? Click here to SHOP OUR HOME, including the dining area, living room and more! 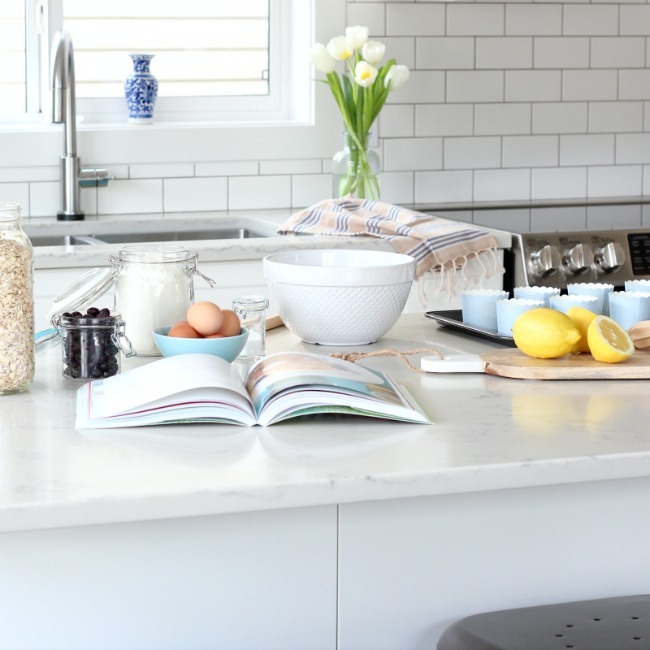 I hope you enjoyed this classic white kitchen renovation post. If there’s something specific you’re interested in knowing, be sure to share it in the comments below! 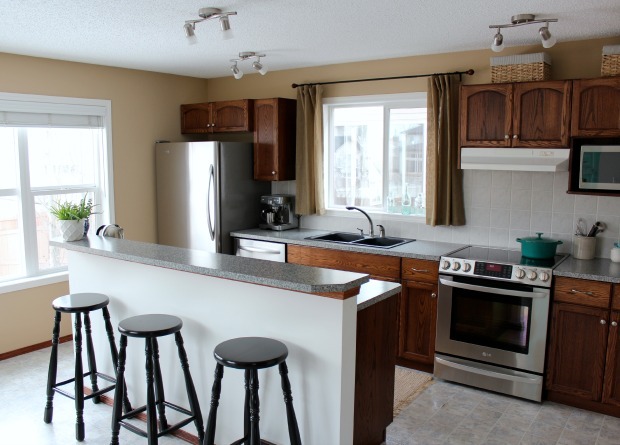 You can also read this follow up post: Top Questions About Our IKEA Kitchen for more details. Beautiful kitchen! Don’t you find that you try harder to keep it tidy now? We used the same TCE countertop and I completely agree about checking out the slab in person, I ended up changing to the bolder veining in the 4005 after seeing it in person. 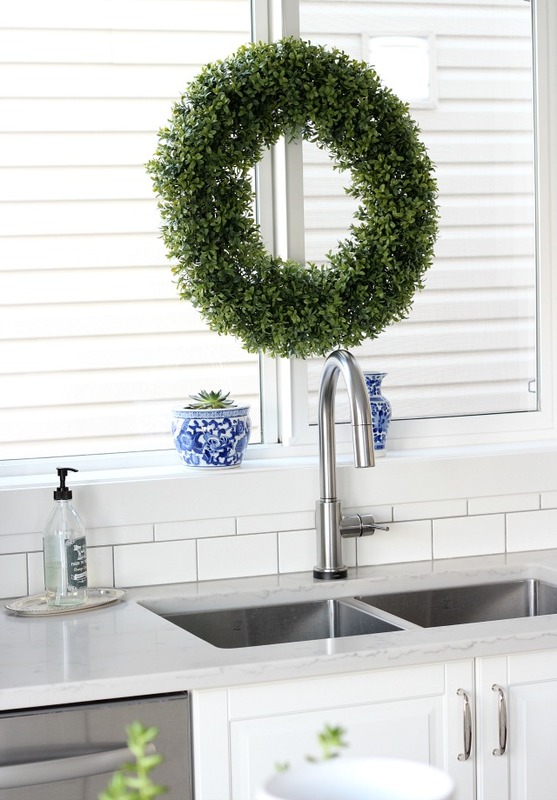 I am currently considering the TCE 4005 for my new kitchen, I was so glad to find a few bloggers who have pictures to share, it’s so helpful! Are you still happy with your choice now that you’ve spent some time with it? I’ve never had a quartz countertop, only laminate and currently granite, which other than a few chips, I have no complaints about. Hi Karen! We are very happy with it. So far, it’s held up well with no chips. We had one incident where turmeric was left of the surface and it stained a bit. I took baking soda and water and let it sit for a while and, voila, it came out no problem. The colours work perfectly in our kitchen and seem to tie the whole main floor colour scheme together. I would definitely choose it over our previous laminate one even though it’s quite a bit more expensive. I am considering the TCE 4005 as well and your post has been very helpful in seeing an “in real life” example. Question- Did you opt for the 2 or 3cm thickness? Hi Penny, We did the 3cm thickness. I’m planning to re-do my kitchen w/ ikea…same cabinets. Thanks for the ideas for hardware and lights. Did you use the kickboards under the cabinets? If yes, which ones. Did someone help you plan where to put drawers/cabinets for greatest efficiency? Hi Mary Beth, I believe we used the FÖRBÄTTRA toekick. I designed our kitchen layout and components. I’ve opted for custom doors painted in Simply White (the off-white of the IKEA door looked very “off” in my north-facing kitchen). Do you think the TCE 4005 would look dirty with the crispness of the simply white doors? I love the veining but I worry it’ll dampen the crispness I’m looking for. Hi Shannon, Yes, the IKEA off-white cabinets can look very “off” in a dark or north-facing kitchen. I find ours change from season to season with the changing natural light. If you’re going for a bright white kitchen, the TCE 4005 may be too muddy looking. I love how it warms our kitchen up a bit and ties in very well with grey grout in the backsplash. It seems to work well with stainless appliances, too. Hi Shauna – Your kitchen inspired me! I just got my counter installed today (I used IKEA discount and choose the Frosty Carrina.) I am going to use standard Lowes American Olean subway tile. Right now I am totally debating using Mapei Soft Gray or Pewter grout….right now I am leaning toward pewter. My question – What size tile spacers did you use? I need to pull in more color and love what you did (plus inspire me use Pewter! )….tile goes up this Thursday…yikes! Hi Tricia, Thank you for your kind comments :) We used 1/8″ spacers. I’m glad we went with the pewter, as it has held up well and helps break up all of the white. A friend went with lighter grout in her bathroom and regrets it. 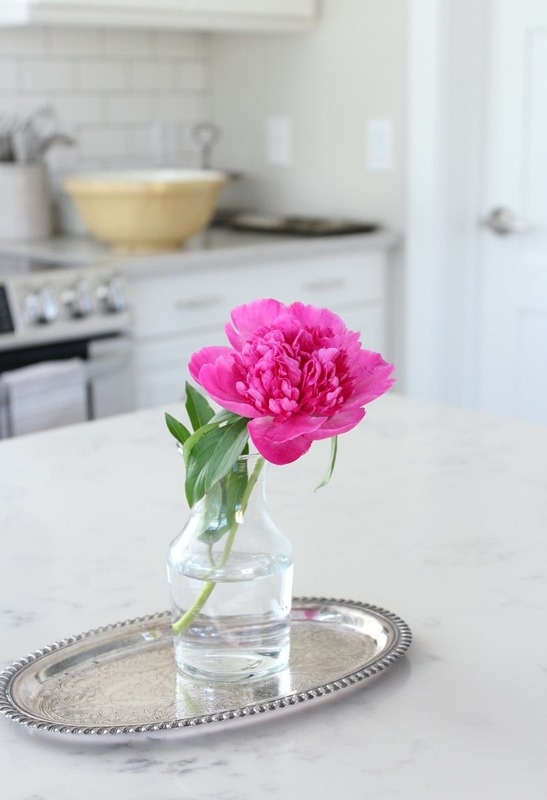 Of course, it depends on the look you’re going for and what works best with your countertop. I’d say, pull out a darker colour if you can. Beautiful kitchen! This is almost exactly the look im planning for our new construction. Do you happen to remember exactly which tile this is? When I click the link I’m seeing pure white, gloss white and matte white, but no off-white. I’m trying to find a tile that looks nice with the bodbyn off white and yours looks great. Thanks for any help you can provide! 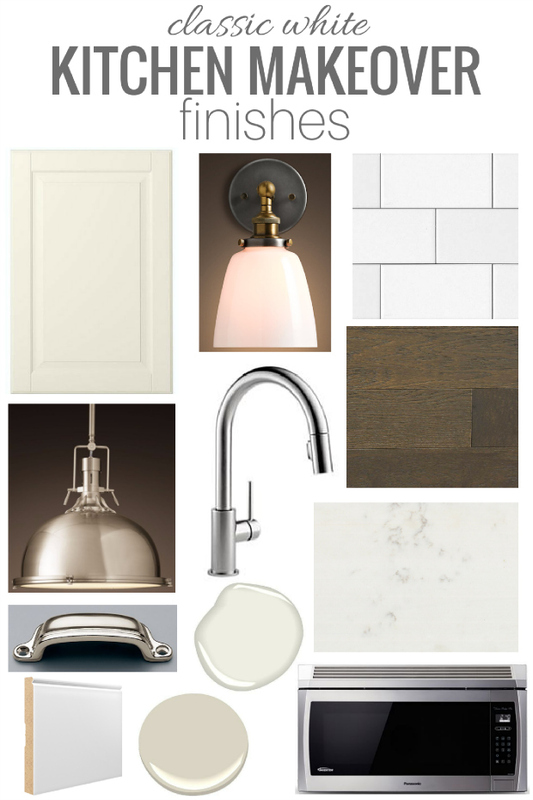 Hi Kirstin, I’m not sure if the off-white is still available, but I have more backsplash info in this post.